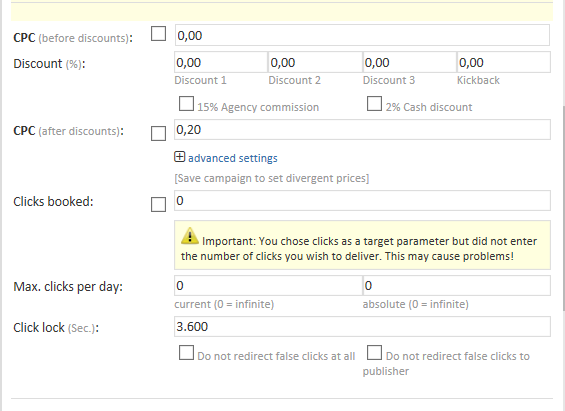 Login to your account , inside advertiser account you can see campaigns tab , click on there. 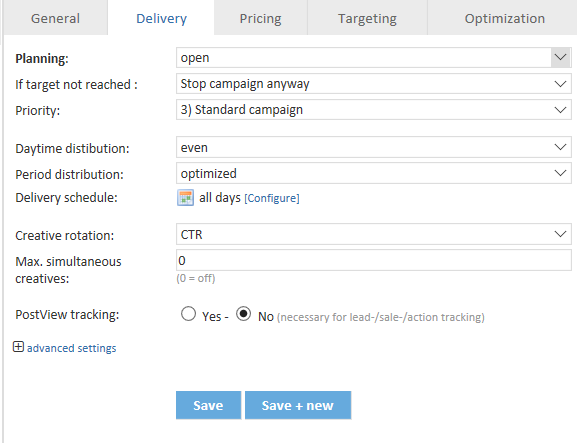 Click on the Tab Campaigns to see various campaign setup and monitoring options. * All Mandatory Setting fields are in RED to ensure quick setup. 4. Enter email id for reports and select freq. of email for campaign reports. 2. If target not reached - Stop or Continue? Select Continue, to continue campaign beyond stop date. 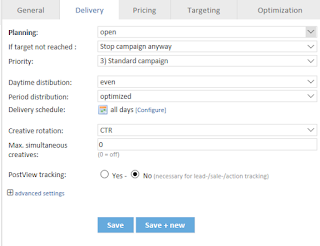 if undelivered campaign and you want to stop with partial delivery, click on Stop. 3. Priority: Choose from 1 to 5, 5 is highest. 6. Delivery Schedule - This will open up option to choose from delivery slot from 7 days x 24 hrs. 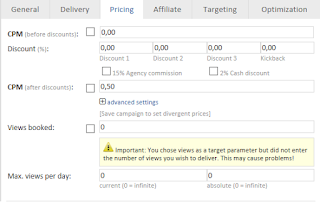 So, you can do exact targeting based on time. 7. Creative Rotation: If you have multiple landing pages or banners you can use this feature to optimize based on CTR, eCPM or Actions. Please note Min CPM Bids: $0,50 - for campaigns to trigger. Select check Box on CPM before discount. Select 15% Agency Commission if you are an agency, and 2% Cash Discount if applicable for you. Remember this will lower down your effective bid on publisher end effecting you effective spend, and is usefull only if you are an agency. Choose these settings same way like CPM settings, if you want to RUN a CPC Banner Campaign. Please leave them unchecked for Popup/Popunder Campaigns. Select Max Daily Spend Budget in USD. Invert Option allow you to Targeted everything else other than which is selected. Example in geo targeting when you choose Target Country India with invert option, it will target all countries except India. It works in same way with Carrier, Device, Speed, IP and other targeting options. Network Provider Targeting - Carrier Targeting option for Mobile Inventory and ISP targeting for Desktop. Choose which network you want to target based on speed, choose from Analog / Modem, DSL/Cable, Company netowork & Mobile Network. 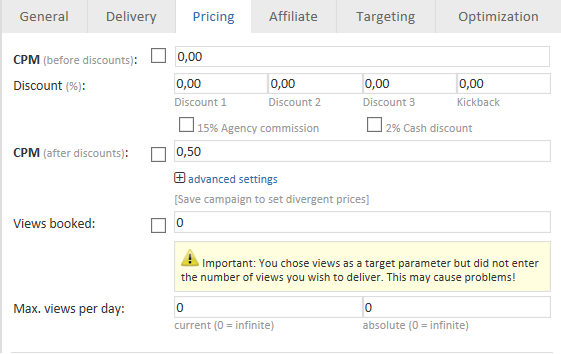 Select from options to targeted user or audience based on different profiles. Target users based on different browsers. Amazon, Chrome, Comodo, Firefox, IE, MIUI, Opera, Safari, UC and more. Target Traffic based on devices they are browsing, Desktop, Smartphones, Tables and smart TV's. Target traffic based on specific IP range or set of ips. Choose language you would like to target. Choose Operating System you would like to target, choose from windows (various versions), Android, Apple iOS, Apple Mac OS, Linux, Symbian and more..
Target Mobile Web based / InAPP inventory. 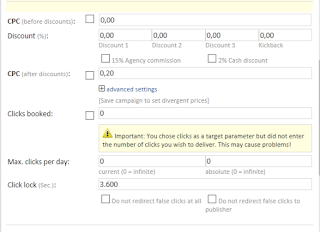 Retargeting old converted audience, and parameter targeting. other than this, Domain URL, Keyword and App Targeting options are also available in beta testing mode. Optimization mainly has to do with the Freq cap settings. 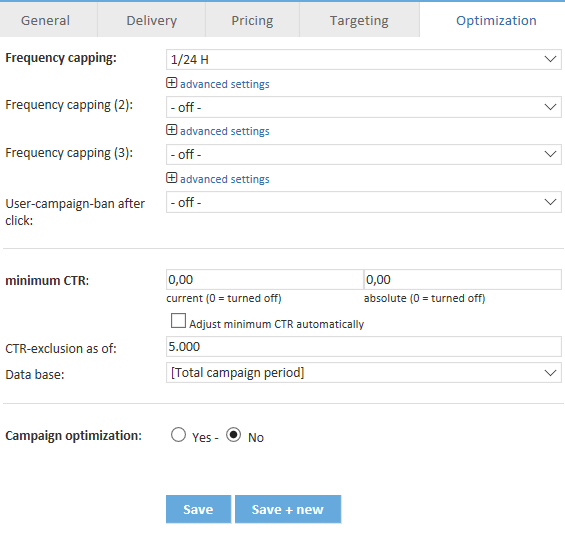 you can setup freq cap you prefer based on your campaign requirement, standard freq cap is 1 visit per 24 hrs, 1/24H. Once Campaign Setup is done, we need to setup Creative for this campaign.